This fine stele attests to the enduring vitality of the Gupta style which created Buddhas of this type some six hundred years earlier. At the same time it is an easily recognizable product of the Pāla period. Typical is the surround, a pearl wreath bordered by an interlocked flame design. The leaves of the highly stylised tree behind the Buddha do not have the characteristic shape of the leaves of the pipal tree; yet it has a weird botanic similitude. Marvelously projected against the otherwise plain ground, the Buddha stands with considerable déhanchement. His lower garment, commencing just below the navel, causes a slight swelling of the abdomen above; it extends below the upper garment in a similar and exactly parallel double pleat. The upper garment, likewise wholly transparent, ends in a transverse wavy line resembling the yajñopavīta, the sacred thread worn by the three twice-born castes. The right hand (missing) was almost certainly in abhaya, the “do not fear” gesture. The left holds, gathered up, the ends of the upper garment. There are three rings or folds around the Buddha’s neck and he is depicted as usual at this time with the ūrṇā, his hair in little ringlets or snail curls, with the uṣṇīṣa. 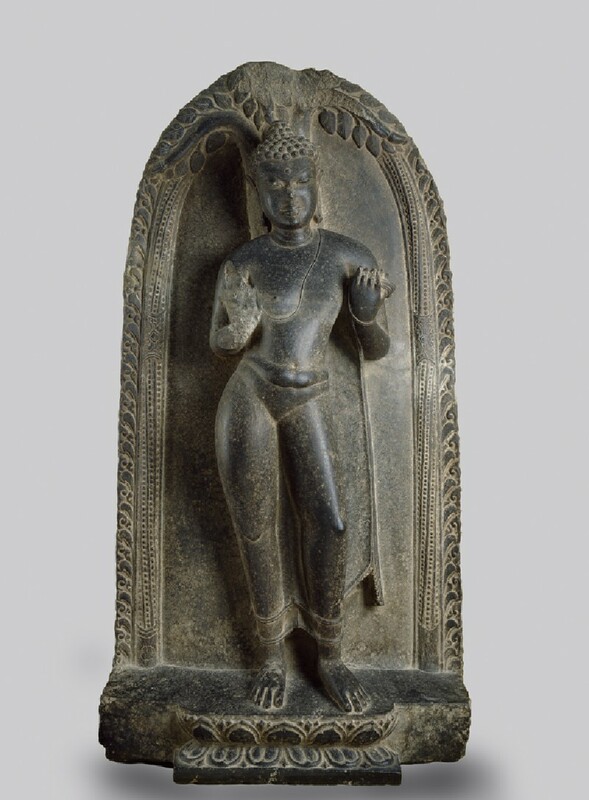 All the features of this Buddha, except for the curious way the top of the upper garment is treated, derive from or are slight modifications of the formula first devised at Sarnath in the second half of the 5th century. The déhanchement is more pronounced, there is no attempt to indicate the presence of the sexual organs and the face is a narrower oval but the smooth interlocking volumes of the body, although more sharply angled in relation to each other, are the same.